The President of Russia Vladimir Putin, at a large press conference on December 20, ignored a large banner demanding to give an answer to one million signatures against the pension reform, a correspondent of the Rossa Primavera News Agency reported. 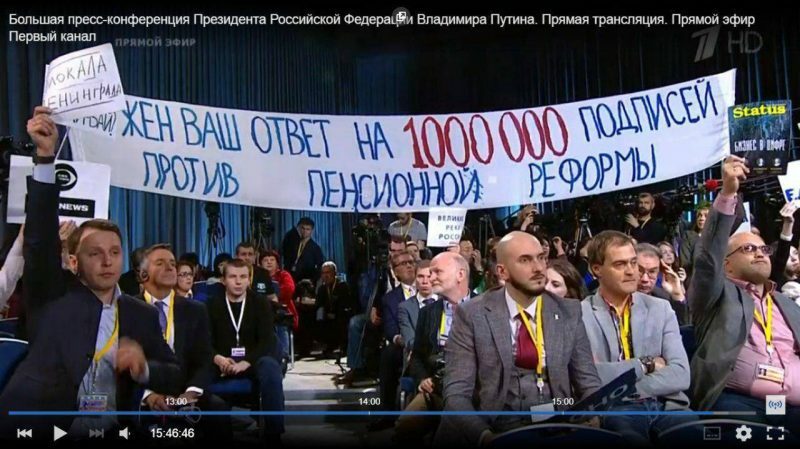 A banner with a statement “1,000,000 signatures against pension reform are waiting for your response” was unfolded by journalists of the Rossa Primavera News Agency. However, the president did not comment on it at his yearly conference. The statement was on a canvas at least five meters wide, written in large letters, but the president ignored it. On September 25, activists from the Essence of Time movement submitted over one million signatures of Russian citizens under a petition against the pension reform. One month later, an official from the Presidential Administration commented this petition, instead of the direct addressee, the president. On October 3, the president signed the pension reform bill into law; the new retirement ages will become effective on January 1, 2019. This entry was posted in News from Russia and tagged Essence ot Time movement, Pension reform, Political War, Vladimir Putin. Bookmark the permalink.